Composed by Matthew Harris. Choral Works (inc. Oratorios). Modern, Choral, Christmas. Piano/Vocal score. Edition Peters #EP68005. Published by Edition Peters (PE.EP68005). 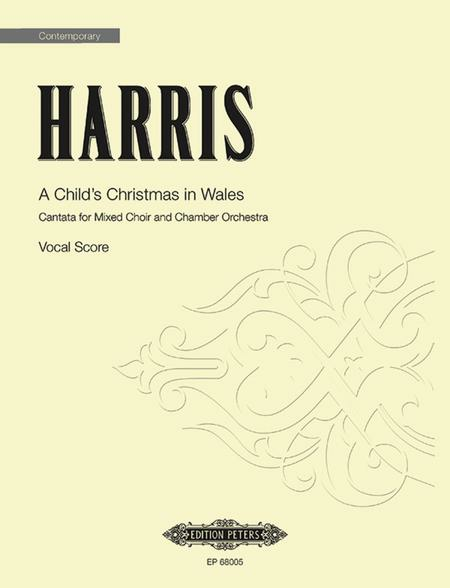 This text of this cantata comes from Dylan Thomas' "A Child's Christmas in Wales". American composer Matthew Harris was born in 1956. He has studied at The Juilliard School, New England Conservatory, and Kingsborough College (CUNY). He lives and works in New York City. SATB with solos (the solos, in the main, are not extensive and do not make great demands upon the performer; they may easily come out of the chorus; the beautiful tenor solo, on the other hand, does require greater prowess, including a high Bb) - Piano/Vocal Score.